The HII Database. The database acts a repository for all sorts of configuration and user-interface resources, including forms, fonts, strings, images, animations, and keyboard layouts. The platform and individual drivers can install and remove these resources. The HII Forms Browser. The browser is the platform-provided user interface where the forms are displayed and input from the user is taken in order to update configuration settings. The platform firmware decides when the user interface should be displayed. This is different from legacy BIOS and UEFI 2.0, where individual option ROMs could put up their own user interface elements, provide their own boot hot keys for entering those utilities and delay the boot in order to display instructions and copyright information. Now, with UEFI 2.1 and beyond, the individual drivers provide user interface information to the platform and the platform presents it to the user. In most implementations, the decision about when is controlled by the UEFI Boot Manager. The how might be part of the boot manager itself or a separate driver or application. Why? The boot manager is already responsible for hot keys for launching boot options and applications. The boot manager is also responsible for the UEFI driver health support and the UEFI user identification support, both of which can be user-interface intensive and are heavily involved with the boot process. For drivers, the most important API is the EFI_HII_DATABASE_PROTOCOL. Normally, during driver initialization (if one page manages all driver-supported devices) or during Start(), the driver will install the forms and strings that it will use for configuration, driver health and user identification using NewPackageList(). ExtractConfig(). Return the current configuration settings. RouteConfig() . Change the current configuration settings. Callback(). Handle callbacks while the user is interacting with the forms. That's it. The driver publishes forms and strings and provides a way to read and write configuration values and handle callbacks from the forms. Of course, there's a lot more in the nitty-gritty details and we'll dig into that soon. But next, week we will spend a little time on how the resources are put together and delivered to the HII Database and even OS-present applications. There was no consistent look-and-feel for a platform, since each driver got to pick its own color scheme, its own keyboard commands and its own screen layout. Individual drivers had to make assumptions about the type of input and output devices available. For example, some platforms might have five buttons and a two line 25 character LCD display while others might have BitBlt graphics and input-method editors. 3rd party drivers would have to invest a lot to make their drivers work on a wide range of consoles. There was no means of centralized platform configuration (for provisioning or remote management). For example, if I wanted to save the settings from one platform and use those to configure a brand-new bare-metal platform. How to get ahold of the settings and apply them in a uniform fashion? Localization. Localization is the process by which a product is adapted to a local market. Most significantly for platform firmware, this includes display languages and input languages. Forms. Forms provide the abstraction by which drivers expose the configuration settings to the platform firmware. Remote and Off-Line and OS-Present Configuration. The configuration settings for a platform must be exposed in such a way that an implementation could support a variety of alternate ways to configure the platform. For example, remote scripting, remote interactive, semi-interactive (off-line but with forms) or OS application-driven configuration of the platform. Provide APIs which would allow drivers, including those on plug-in cards to have full access to the HII resources, including fonts, strings and forms, and be able to contribute additional resources. Support a wide-range of display devices. This led to a fairly sophisicated and flexible infrastructure and a lot of confusion, because in many places the HII specification added abstractions between display, configuration and configuration storage that had never existed before in the firmware world. Next week, we'll look at some of the key design decisions and why they were made. Driver1. Standard set of driver-related commands. This includes connect, devices, devtree, dh, disconnect, drivers, drvcfg, drvdiag, reconnect and unload. Debug1. Standard set of debug commands. This includes the following commands: bcfg, comp, dblk, dmem, dmpstore, edit, eficompress, efidecompress, guid, hexedit, loadpcirom, mem, memmap,mm, mode, pci, sermod, setsize and smbiosview. Network1. Standard set of networking-related commands. This includes ifconfig, ipconfig, and ping. Install1. Standard set of commands to aid installation. This includes only bcfg. Shell profiles provide an extensible method for creating standard groups of commands that can be relied up by 3rd party applications. Next Time: The UEFI Shell API. 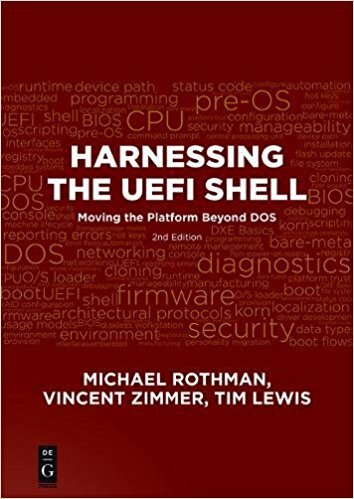 The UEFI shell comes in four flavors, called levels of support. These "levels" (from 0 to 3) allows for compliant implementations of the shell that range from light-weight, bare-bones to a full-featured versions. At the same time, the user of the shell can determine, at run-time, whether the necessary features are available for it to run correctly. Why offer different levels of support? Size. While the rest of the universe expands storage capacity exponentially, the firmware world still lives with relatively expensive flash devices. Suffice it to say that the types of flash and trends in flash which are driving down the cost for devices such as the iPod are a little slower in dropping the average price of motherboard flash. Flash size can significantly impact the cost of a motherboard. So there is constant pressure to keep the "required" elements of the firmware as small as possible. NOTE: One additional trend is that silicon vendors such as Intel are gobbling up room on the flash devices as well, both with their own firmware modules and with support for on-board micro controllers such as the ME (Management Engine). In some systems, 2/3 of the flash space is consumed by support for these devices. So the shell in the firmware must be small. Video & Keyboard Support. When most of us think of a "shell" we usually think of some sort of command-prompt console at which a user can type in commands, execute scripts, etc. However, in many of the systems, the shell is used primarily for execution of scripts or applications that do not require a console at all. 0 (Minimal). This is the most basic support. The APIs are fully supported, but there is no support for scripting, aliases or a console. Normal shell applications will execute. 1 (Scripting). This level adds support for scripts and the script control commands, but none of the other commands that do anything (such as write text to the screen or manipulate files). This allows scripts to be launched, but all of the script commands must be executables (.efi files) on a mapped drive. 2 (Basic). This level adds file script commands, such as rm, ls and mkdir. At this level, there is still no console support. As a result, those commands which would normally output to the console do not do so at this support level. Notice that, up to this point, an application could use the APIs to read and write files, but not execute scripts which used the common file manipulation commands. 3 (Interactive). This level adds console input and output, as well as those script commands which depend on the console, such as echo, type and cls. Hey, just noticed that UEFI has officially updated their roadmap here. For me, the big questions revolve around SCT support for ARM, HII and the user identification and security parts of 2.2 and 2.3. These additions are hefty (clocking in at over 300 pages). 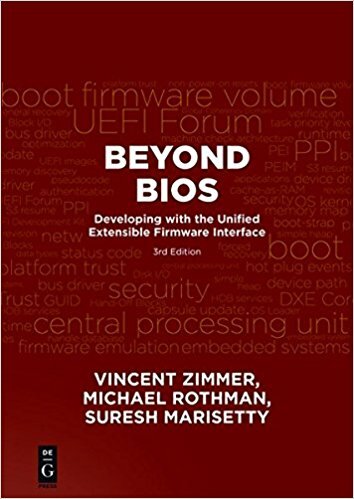 What's The Latest on UEFI Programming?